This is the 9th installment in my complete guide to house training series. Paper training is almost certainly the most commonly used method of house training in the world, with many people using it exclusively as the only method they use. Others like myself use it as a small part of their overall plans, relying more on a mixture of using a crate and constant supervision. But what’s true of paper training is it’s a very old, tried and trusted technique. But just because it’s traditional and well-known doesn’t mean it’s necessarily the BEST method. 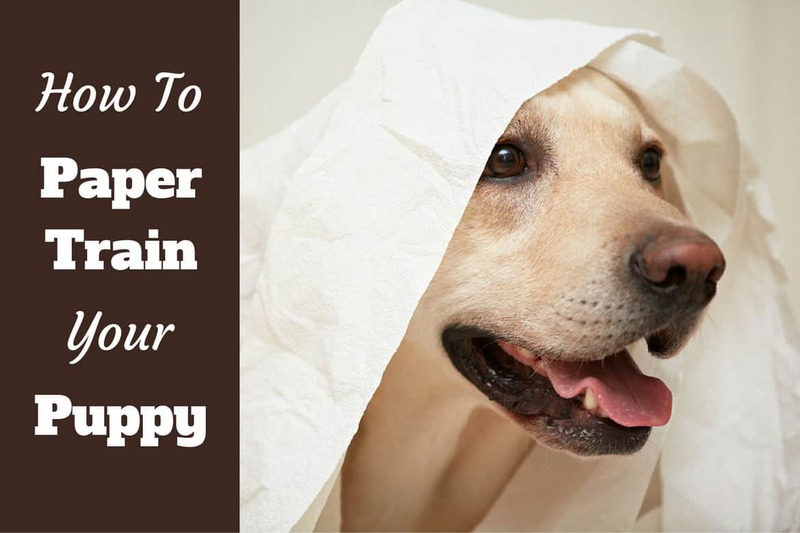 In this article we take a look at how to paper train a puppy, who should consider using it and some convincing reasons why in fact it isn’t always such a great idea. What Equipment Is Needed For Paper Training? How Does Paper Training Work? What Is The Technique And Method? Who Is The Paper Training Method Most Suitable For? Traditionally, paper training is training your puppy to eliminate on old newspapers placed in an area set aside as a bathroom spot for your puppy. Nowadays, many people use specially made puppy pads, litter trays and even fake grass or sod boxes in place of newspaper, but the method is still the same. The idea is a puppy gets used to toileting on paper and stops going in places that they shouldn’t, and the paper absorbs and holds the urine and feces making it easier to clean up. For paper training, all you really need is old newspapers, some food treats to reward eliminating in the right spot and some cleaning agents for the inevitable accidents. Many people choose to use ‘puppy pads’ that are absorbent pads, sometimes scented so they encourage your puppy to toilet on them. Because small sided trays are available that hold the pads, it can make cleaning much easier compared to newspaper due to fewer spills. There’s also the option of litter boxes much like a cat uses, and some ‘novelty toilets’ available. These can be effective, but to me they are completely unnecessary. 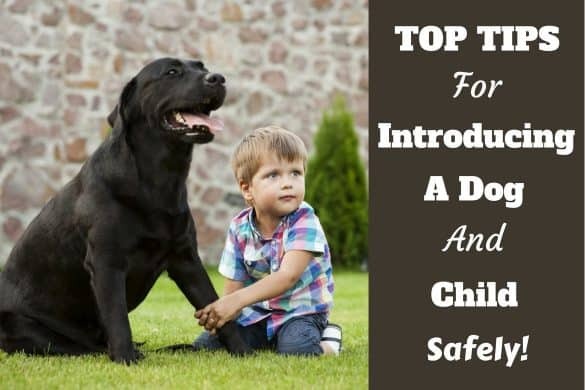 You will also likely need an x-pen, play pen or baby gates depending on how you choose to confine your puppy to a single room when you’re out of the home. You can read my advice on the equipment, products and supplies you might need for house training and why by clicking here. Puppy’s get used to eliminating on the same surfaces they’ve regularly been on before. Puppy’s want to toilet in places where they can smell they’ve been before. Puppy’s prefer to toilet on softer, covered surfaces than hard and cold floors. 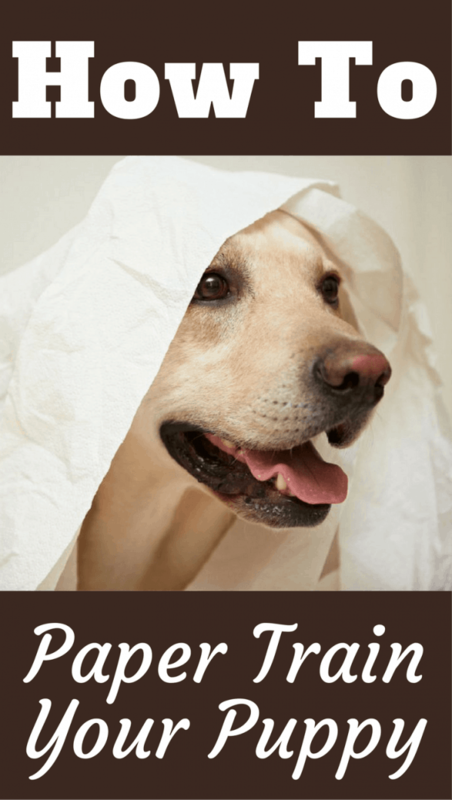 In essence, you cover a wide area, allow your puppy to eliminate there, slowly reduce the area that the papers cover then move the paper slowly to the spot you eventually want as a permanent toilet. Step 1: You want to decide on a place for your puppy’s bathroom spot. Choose a relatively small area where you can easily confine your puppy with a baby gate, or set up an x-pen or puppy play pen. When choosing a room, opt for one with a hardwood, tiled or linoleum floor that’s easily cleaned and will not soak up urine in case of accidents. Avoid carpeted areas as a puppy will prefer to toilet there with softness under their feet and not on the paper. A kitchen, bathroom or laundry room is ideal. If using an x-pen or play pen, lay a plastic tarpaulin sheet underneath to give a non-porous and easily cleaned surface to protect the floor underneath. Step 2: Cover the entire room or area with newspaper (or puppy pads if you’re using them) and set up your puppy’s bed, water bowl and a few toys at one end of the room. Then bring your puppy in to the area. With the area covered, they simply must eliminate on paper and simply cannot miss. This forms the idea in your puppy’s mind that they can and must eliminate on paper. Step 3: Don’t leave dirty paper down long. Try to clean it as soon as it’s dirtied because you want your puppy getting used to a clean place and no dog wants to spend time close to lots of their own waste. But when cleaning, keep a piece of the previously dirtied paper and use it to encourage eliminating in the spot you want. Puppy’s like to eliminate where they’ve been before. Where they can smell a spot they’ve previously been, they’re drawn to that spot to eliminate again. This is why it’s so important to avoid accidents, and why thoroughly cleaning stains and odors is so important to avoid repeat performances. With paper training you use this in your favor by keeping some old soiled paper, and placing it in the area you would like your puppy to eliminate. Usually at the far end of the room away from their bed and water, under one clean layer of paper. Step 4: After a few days of following step 3, you should find that your puppy begins to eliminate close to that one area and the rest of the paper starts to stay clean. Now you can slowly start to cut down on the area that’s covered. Start by removing a third of the paper that sits under the area of your puppy’s bed and water. Puppy’s have a natural instinct to potty away from their bed and water supply, so they will naturally gravitate toward the paper covered end of the room. You’ll want to watch your puppy though and if they try to toilet in an area that isn’t covered by paper, you must intervene and redirect them on to the paper and praise them when they do relieve themselves there. Any time they do eliminate on the paper without any of your help, you also want to praise them heavily. This rewards and encourages pottying on the paper. After just a few of days of this, your puppy will quickly learn that they should only use the paper as a bathroom. Step 5: As long as your puppy is regularly pottying on the paper, you should now begin to gradually, day by day, sheet by sheet, reduce the total area that the paper covers. Remove the paper that is closest to your puppy’s bed and water area, leaving the paper covering the area farthest away. If your puppy eliminates off the paper, you may have to go back a couple of steps and increase the area covered once more. This is quite normal, but usually means you went too fast. Step 6: Once you’ve reduced the area papered to just a couple of sheets, you can now start to move the paper over to the final place you’ve chosen as your puppy’s bathroom spot. For most this will be outside, but for some it will be inside. Move the paper slowly, a little each day. Your puppy ‘should’ keep going on the paper. If they make a mistake off the paper, most likely where some paper used to be, then either that area hasn’t been cleaned of odor from an earlier accident or you’ve gone too fast. Go back a couple of steps and then progress more slowly going forward. If your puppy’s chosen bathroom spot is inside, eventually the paper will be where you want them to go and your job is done (if it wasn’t already there.). If outside, move the paper along a wall each day, toward the exit. And in the mean time (since the start), have some paper outside that you encourage your puppy to eliminate on too. Eventually, the paper will be right beside the exit. When your puppy moves to potty on the inside paper, take puppy outside to use the paper. And eventually just completely remove all the indoor paper and your puppy will want to go outside. Though you will have to watch your puppy intently a few days to make sure they do get outside! In comparison to any other method of house training, paper training asks for the least effort from an owner. Once a puppy has learnt to eliminate on paper, they go there of their own accord and an owner just needs to clean away the papers. All other methods such as using a crate, constant supervision and umbilical cord training all need an owner to watch their puppy closely and get them to the bathroom spot as soon as they make moves to potty. But with paper training, after the first few days you just leave your puppy to their own devices. It’s the most passive form of house training there is. So yes, paper training is easy. But don’t think it’s the magical method that everybody would be silly not to use.  Before you decide to use paper training, I’d like to bring to your attention the disadvantages of the method. Not to put you off, but just to make you aware so you can make an informed decision. The main drawback of this method is you are training your puppy it’s OK to eliminate inside your home. If you plan to have a permanent indoor toilet for your dog this is OK, but if your plans are to eventually have them toilet outside only, you’re seriously confusing your puppy and house training will take longer than when using other methods. With paper training you will have more accidents from your puppy until a much older age when compared to other house training methods. Secondly, your puppy learns eliminating on paper is what you want them to do and they become very good at this which presents a problem if you leave your daily newspaper lying around. Or say you visit a friend and they leave a newspaper lying around in their living room? There’s a pretty good chance you’ll find more in the news than expected! A third disadvantage is you have to clean away soiled papers many times each day. You should clean the paper away as soon as it’s dirty for hygiene reasons but also because a puppy will not want to go in a spot that’s too dirty. Therefore you will have to clean a few times each day and could avoid this with other methods that have you take your puppy outside to eliminate. A fourth disadvantage is some puppies learn and begin to think they should ONLY eliminate on newspaper and nowhere else. This is a problem when your puppy doesn’t eliminate on walks or out in your yard because there is no newspaper. To prevent this, always encourage your puppy to eliminate outside by praising them heavily when they do. Finally, and this is a matter of preference but worth pointing out for the main audience of this site. 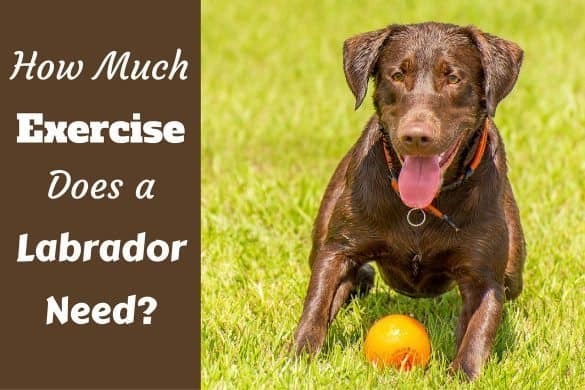 Labrador Retrievers are a large breed that produce a lot of waste. 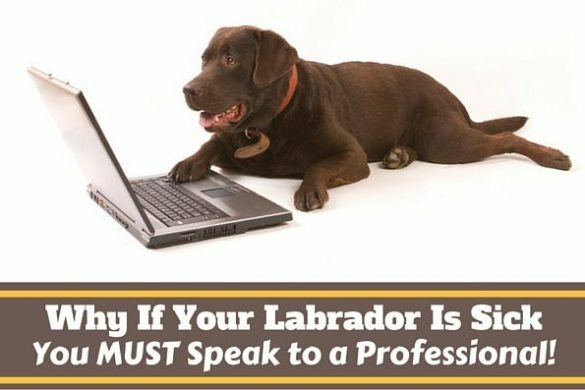 A Shih Tzu or a Pug doesn’t produce much waste and cleaning up after them is easy, but I really wouldn’t recommend paper training for a Lab. The sheer amount of waste causes quite a smell and is hard work to clean up multiple times per day. 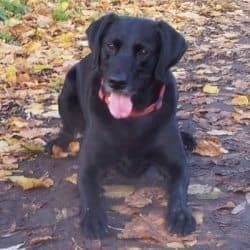 If you know you’re going to be out of the home regularly for many hours and cannot have a person popping into your home to take your puppy out, then paper training is the only solution for you. It’s also a good method to use for people who aren’t able to get outside quickly and easily, such as people with mobility problems or those on the higher floors of tower blocks. When a puppy needs to go, they need to go NOW and you will not have time to rush down 15 floors in a lift! I believe that everyone should use paper training to some degree, no matter which other method they prefer to use. It’s a fact that almost everyone has to leave their puppy alone for 3 or 4 hours at very short notice at one time or another. A time when you won’t have arranged somebody to pop in every hour to take them outside. And when a puppy is very young they cannot be expected to ‘hold it’ for 3 or 4 hours, so you cannot crate them. This is just plain unfair and very wrong. So you should restrict your puppy to a single room such as the bathroom or kitchen, or maybe an x-pen in another room, and paper the area so they can relieve themselves while you’re gone. If you take a little time to paper train them, when you return it will make the clean up so much easier for yourself. Choose for your puppy’s living space a room with a hard, non-porous floor such as tiled or linoleum. This way, anything that misses or soaks through the paper is easy to clean. If such a room isn’t possible, use an x-pen and place a tarpaulin sheet underneath the pen to protect your carpets. Always start by covering the entire area where your puppy spends time, this way they will always start eliminating on paper, they have no choice. This gets them used to the idea as quickly as possible. Clean your puppy’s area regularly, daily at minimum, usually more. Although dogs like to toilet where they can detect by scent that they’ve been before, they also only go in a spot that’s relatively clean. If you leave it filthy, they will start a new bathroom spot. When you clean, keep a sheet of the soiled paper and lay it in the area you want your puppy to use. Not a filthy, dripping piece, but a piece that has at least some odor to it. The smell encourages your puppy to go in that spot again so this helps the process massively. Don’t get disheartened if you make good progress then your puppy seems to go backwards. No house training method is straight-forward, there’s always ups and downs, two steps forwards, one step back. Just stick with your program and you’ll get there eventually. Paper training is the easiest of the house training methods in that it requires the least effort and concentration from the trainer. But please be aware of the drawbacks described above as paper training isn’t necessarily the BEST method. Paper training can and usually does slow down a puppy’s progress if you want them to eventually toilet outside. And a paper trained puppy usually has more ‘accidents’ later into life. It’s the confusion of being able to eliminate inside for months, and then being told they can’t. However, if you can’t get your puppy outside quickly, or have to spend time away from home during the day, paper training is pretty much essential. Crate training and constant supervision are the fastest way to meet success and a house trained puppy, but paper training does have its place in a complete house training plan. 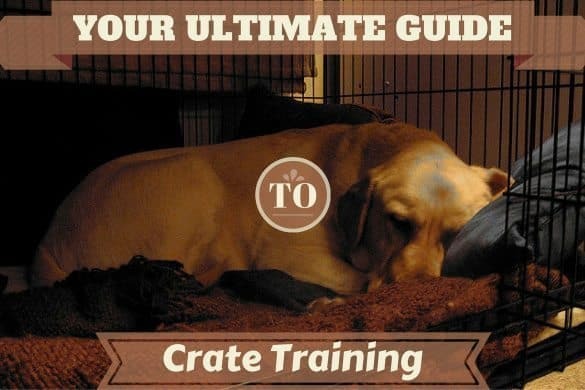 This was part 9 in a 12-part series where I’ve tried to provide all the guidance you could possibly need and covered everything I can think of for you to be able to successfully house train your puppy or adult dog. Why do Dogs Sleep So Much? 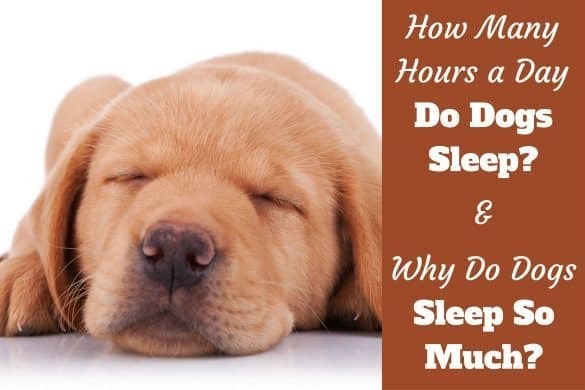 How Many Hours a Day do Dogs Sleep? 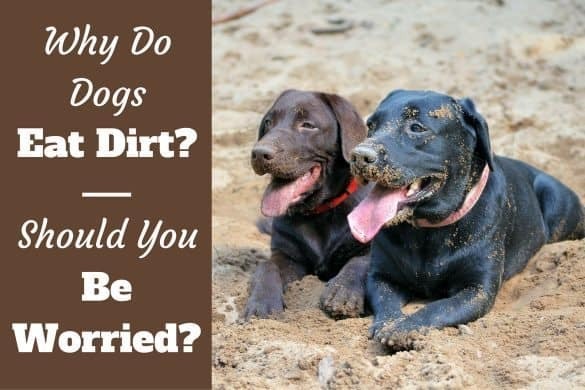 Why do Dogs Eat Dirt? Should I Be Worried and Try to Stop it? I have a 7 month old Yellow Lab Mix. Part Irish Setter. He has recently started jumping fence/ escape. I read on other website that if a male dog is not neutered he is more likely to jump/escape. Is there any truth to this? It depends why he is escaping. Some dogs escape because of boredom and social isolation, others to escape a fear or phobia, others for what’s termed ‘sexual roaming’. When a dog reaches adolescence and the hormones really start to flow, the desire to seek out a mate can be overwhelming which encourages some dogs to escape to try find a mate. Neutering does help with this reason for escaping, but not for the first two reasons. So you need to find out ‘why’ he is escaping before you can begin to prevent it in the best way possible. And research neutering fully before considering it as there are good points and bad points to it. Well, some of it does have to do with him being bored I admit. I live in NJ we had a bad winter and has made it nearly impossible with all the snow and ice to walk him or play in yard. It’s a big subject and I’ve not got a single, definitive resource on it so you should try to read a few points of view. I would just read though the first 10 to 20 results of a common Google search: Pros and cons of neutering. Personally, as I don’t breed or work my dogs (they are family members only) I always neuter my dogs and personally it just makes sense to me as I believe the medical and behavioral benefits far outweigh any downsides. The canine population is too large with too many unwanted dogs without my Monty potentially adding to it, and I’ve never found it to cause any harm or change my dogs personalities much to be fair. And I prefer less mounting, urine marking and so on! I’ve got six puppies I’m containing and trying to paper train in a plastic pool. Sometimes they hit the paper but likely as not they’ll find a spot not covered and go there. I’m disabled and was the easiest method for me until I can find them homes. They’ve pooped on their toys, peed on their sleeping towel? I’ve also discovered they will bite tiny bits of plastic off of the pee pads while playing. I’m afraid they’ll aspirate or choke on it. So far I’ve been amazingly unimpressed by these pee pads. I’ve used them several times and they become sleep pads, play pads and confetti. Help! What am I doing wrong? You’ve about summed it up and from your description aren’t doing anything wrong at all, so don’t be hard on yourself! I’m afraid for a puppy that anything and everything – and I mean ANYTHING and EVERYTHING is a chew toy or thing to be played with. Totally normal. And that includes any puppy pads, paper laid down as a toilet, bedding, towels, your hands and feet, the TV remote – everything and anything. It’s just one of those things we have to put up with until we have taught them otherwise and they grow and wise up a little. All you can do is supervise them and intervene with a firm ‘no!’ when they chew something they shouldn’t, while at the same time giving them something they should. And eventually they grow out of it. But it is normal and the phase will pass. My puppy chews the puppy pads he does his duty on? She started out going on the pads and then she started to chew them? i live upstairs and cannot take her outside. What would you suggest I do? It’s very hard to stop a puppy chewing anything unless you are there in person, to re-direct the behavior. I’ve had the same issue, and it’s something they do grow out of with training. You have to have the pads down, and supervise, and every time he goes to chew, give a firm ‘No!’ and give him a chew toy instead. You need to do this as often and frequently as possible. But while you’re out, you’re unable to and this cannot be helped.